Pasta’s easy. It’s usually the first food you learn to cook, site and the food that sustains you throughout your penniless college days. It’s good, sale fast and cheap, and there’s nothing to not love about that! So, when I need to make a quick lunch before work it’s often pasta that’s my first thought. The hard part is figuring out how to make a healthy, well-rounded meal with it. As with most things carb, I find that I can sit down and eat at least a 1/2 pound of simple, buttery pasta on my own. But me and my bikini know that it’s probably not a good idea. So, I try to have as much “stuff” in my bowl as I do pasta. This week, that stuff happened to be spicy Italian sausage, broccoli, rainbow chard, goat cheese and walnuts. A well-rounded meal chock-full of vegetables, protein and those venerated Omega 3’s. Best of all, it traveled well, filled me up and made a very delicious little lunch. This would make a great fall dish. I’d even add some chopped and peeled apples or some dried cranberries for a more autumn-like flavor. Set a large pot of water to boil. Once it’s at a rolling boil, salt it well and add the pasta. Drain and set aside. Set a large skillet over medium heat and add half of the olive oil. Add the onions, garlic and serrano pepper and sautee until the onions begin to soften. Add the sausage and cook until browned, using your spoon to break up any clumps – about 7 minutes. Remove the sausage and onions to a bowl. Add the remaining olive oil, broccoli and chard and cook until the chard begins to wilt and the broccoli is cooked, but still crisp. Add the sausage and onions back to the pan, then toss with the drained pasta. You may want to drizzle a bit more olive oil over everything at this point, or you may leave it as is. 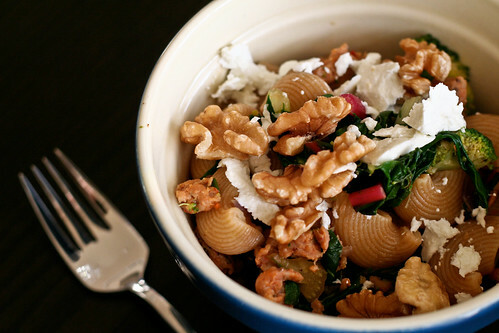 Serve in a bowl and top with goat cheese crumbles and walnuts. When you stir the goat cheese into the pasta, it will become creamy and coat everything like a sauce. Delish!